I have been staring at an empty screen for an hour now. Writer's block? You bet and I blame it on a full stomach. I cannot begin to tell you how much I enjoyed eating sinigang 2 ways. This soup dish always hits the spot. My kids look forward to coming home because on their first day back this is what greets them. But then this is a Kulinarya challenge. So I went further: I made Sinigang Fried Rice. This is my take on a similar dish that my sister raved about on her recent visit to the Philippines. I literally fried every component of the dish and made it into a fried rice. 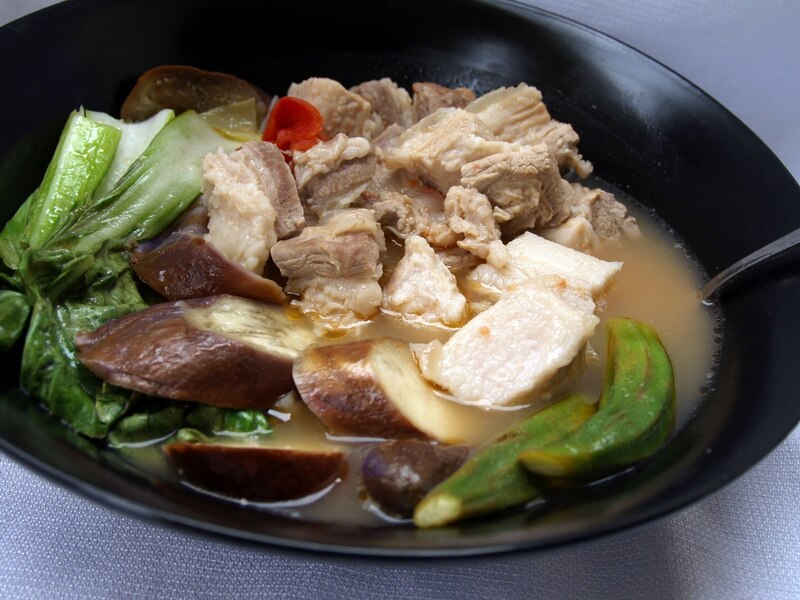 The pork, which was cooked with the sour broth, was fried and had the salty, tangy taste. It is crispy on the outside and soft on the inside. For the vegetables, I soaked them into tempura batter and also threw them on the fryer. I then sprinkled some fresh tomatoes and onions on top of the "fried rice". Added the tamarind broth to complete the sinigang fried rice! Now I'm in a food coma... LOL! I hope you are having a great weekend... and oh, please visit the other Kulinarya members' recipes. 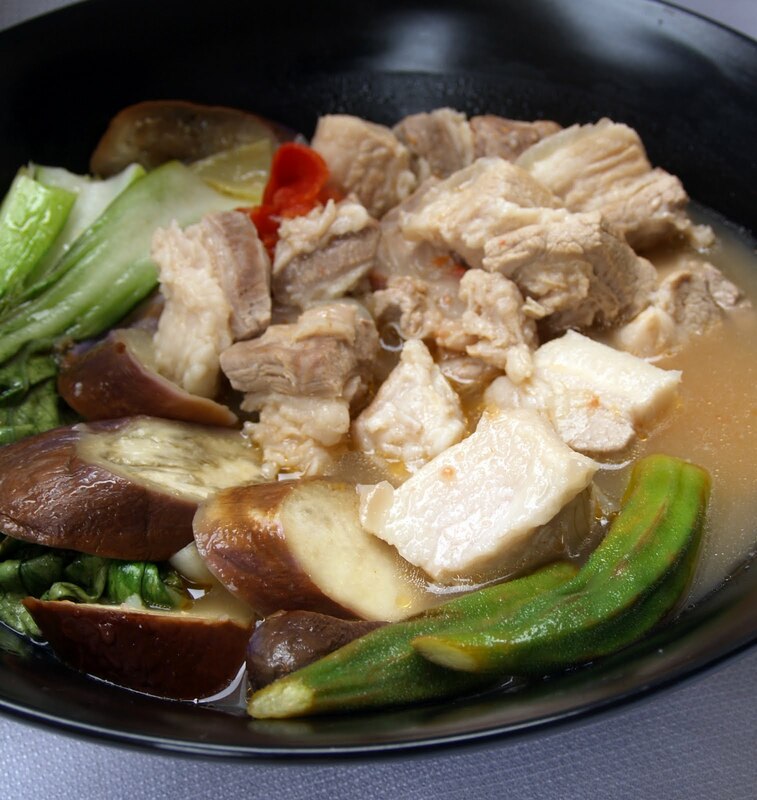 You will be amazed on how many ways Sinigang could be made. Enjoy. 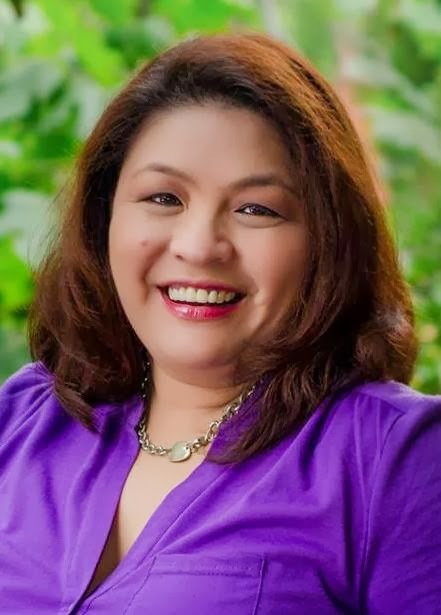 Malou, I know one of your MANY SPECIALTIES is Sinigang na Lechon and I am so looking forward to seeing it today, pero this post is also a wonderful surprise! I like it, too =). Malou, SARAP ! Can you hear me slurp? 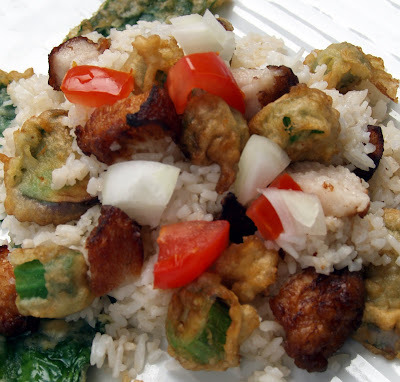 What a terrific way to serve Sinigang, the Fried Rice way. Must try this one. And our traditional way with the pork, gosh, I want to grab the okra and just bite into it. Great pics and great post ! Sinigang Fried Rice is so original, Malou (just like you -- sipsip, ba? lol) This is something definitely worth trying. YUM! Oh my god, Malou you are so creative! Who would have thought of making sinigang this way but a creative mind like you. BTW, for a good writer like you, yes it's called writer's block. For someone like me it's called -- brain fart! Annapet: You are so silly but yeah I cook sinigang na lechon as much as I cook lechon paksiw for left over lechon. I hope you get to try it. Are you still working on your sinigang S? LOL! Betty: as you said you may need lipitor with the fat of the pork hehe. But yeah i hear your slurps LOL! TagaTugue: Nothing beats FRIED? But of course!!! Thanks again for stopping by. Carol: Yes please try it. Hubs was skeptic at first but when he tasted it, he retracted what he said haha. Ray: sira ka talaga, but I can't wait for your post too. When are you posting? I think its' orginal.I haven't seen anything like this. Frying the components is just genius! Malou I love it. Fried Sinigang. I just showed my mum and she said you are incredibly smart. What a great way of serving such a traditional dish. I am going to try this for sure. This is really interesting Malou ! I will try this soon ! WOOOOOWWW!!! I am so bookmarking this! 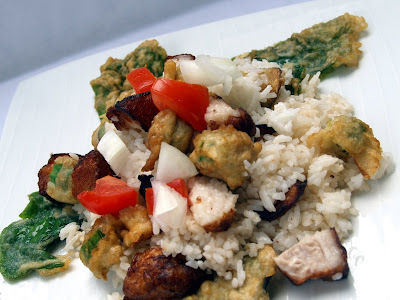 Sinigang Fried rice, that is a brilliant idea! Yummy, I love sinigang with sinangag and you combined them! I will definitely try your recipe, thanks for sharing! 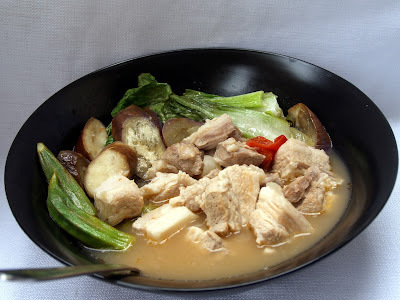 I adore sinigang, and this is incredibly creative, Malou!I just have to try it. Enjoy the rest of your weekend! I'd rather be comatose than not eat this. What have you done? Give me that! OMG you definitely went outside the box or as Ray would say it, "outside the wok" on this one. You are so creative. Your creativity is such an inspiration to me.